The gallery on the Galaxy Tab 3 10.1 can be sorted into albums, all photos and videos, time, location, etc. Just like in the phonebook, you can choose what kind of content should be displayed - photos and videos from the phone, Dropbox, Facebook or Picasa. You can pinch to zoom in the gallery and thus manage the size of the thumbnails. Upon a press and hold on a picture, the gallery gives you the option to select multiple images, which you can then mass delete, share, copy or move. The large display is great for viewing photos - the screen is as big as most photo frames and the lower resolution doesn't really show. When viewing a single photo, you'll find several sharing shortcuts and a delete button above the photo, alongside an Allshare cast button for sharing the image over DLNA. Below the image is a line of small thumbnails of all other photos in the album, which you can tap to move to other images or simply swipe to the side. To enable photo editing in the Gallery you'll have to install the (free) Photo Editor app from the Samsung App store, a 36MB download. Once installed, you can easily retouch photos right in the Gallery itself. The photo editor gives you options like crop, rotate, color and effects. You can also make a memo on top of the picture. The My Files app hasn't changed really - it's an efficient and simple to use file manager. It can move, copy, lock and rename files in bulk, even send multiple files to another phone. My files will only browse the memory card and the large internal storage (it can't access the system drive). The TouchWiz music player on the Galaxy Tab 3 10.1 is jam-packed with features and supports a wide variety of file formats, including FLAC, Wave, etc. Music is sorted by the usual Artist, Album, Playlist, etc. but there's also Folder support - it's quite handy as it saves you the need to sort songs into playlists like on so many other players. The Samsung Galaxy Tab 3 10.1 can also search for content on third party DLNA servers like PCs or other phones on the same network. The Now playing screen gives you the usual options - a scrollable timeline, play/pause and skip controls, repeat and shuffle, volume control but it also adds lyrics support, an AllShare shortcut and a direct sound settings shortcut. While listening to a song you can find music controls in the notification area, and the lockscreen as well if you have the relevant lockscreen widget added. The video player found on the Samsung Galaxy Tab 3 10.1 has four tabs across the top. The default one, Thumbnails, provides a thumbnail view of all the videos on your device, including the ones on an attached microSD card. Unlike on some other Galaxy smart devices, the thumbnails are not animated, likely due to the low onboard RAM. The List view is similar to Thumbnails, except that it allows you to view more items on the screen, while Folders view allows you to easily browse your videos sorted in folders. Finally, nearby devices lets you stream videos to the Tab 3 10.1 via DLNA. The video player lets you choose between three crop modes for how the video fits the screen. The video player lets you squeeze the best viewing experience out of the large screen, and some of the same SoundAlive audio-enhancing technology is available here too. Pop up play is here too - it moves the video in a small floating window and you can use other apps on the phone while still watching the video. You can use pinch zoom to adjust the size of the video. On devices that support Multi-View, this feature becomes rather redundant, but it's a welcome addition here. The Samsung Galaxy Tab 3 10.1 offered a list of subtitles and let us pick. It scans for all subtitles, so the file doesn't have to have the same name as the video file, and there's even support for foreign languages. 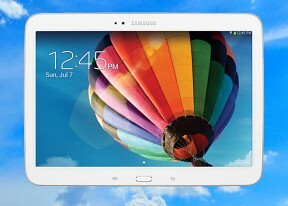 When it comes to video codec support, the Samsung Galaxy Tab 3 10.1 passed with flying colors. It played everything we threw at it, including Xvid, DivX, WMV, MP4, MKV, 1080p videos, including ones with AC3 sound tracks. The Samsung Galaxy Tab 3 10.1 is the second member of the Tab 3 family that we put through our audio quality testing routine and we are pleased to say that it did every bit as impressively as the Tab 3 8.0. When connected to an active external amplifier it delivers perfectly clean output with no interferences whatsoever. It's not a particularly loud device, but it's not too quiet either, so you will have more than enough oomph with just about any headphones. When we plugged in a pair of headphones there was very little degradation to be witnessed. The stereo crosstalk goes up, but still remains very solid and the rest of the readings are barely affected. A very solid performance indeed. 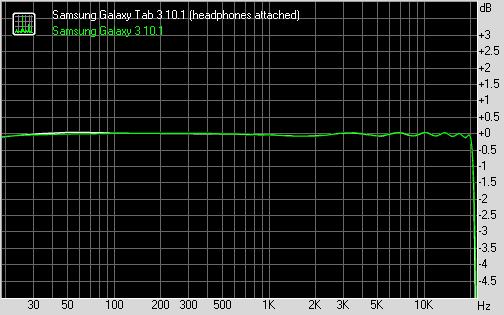 The Galaxy Tab 3 10.1 earned a mark of Very Good in our loudspeaker test, which means that you should have no problem hearing the device even in the noisiest of environments.